Dolce Vita got really unique with the Cauzzie pumps. The bead work and embroidery are Native-American inspired but also has a boho feel to it. I guess it’s all that flower power going on. It’s not just the frills and fringe details that caught my attention (although there’s no denying everyone will turn their heads twice for another look). 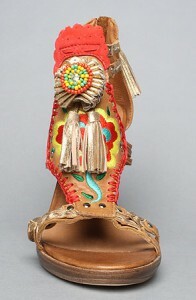 The embroidered leather upper straps are artsy in its own way. I have to say the tassle on the back zipper is a bit too much for me. Top view of the fringes and bead work. The white Dolce Vita Cauzzi has a pink tassle on the back zipper which might be too much for me. Dolce Vita's Cauzzie Pumps in Natural color is more my style. The Cauzzie pump also comes in Natural color and I have to say it’s much more my style. The tassles are just a but lighter than the dominant natural color and the bead work compliments the whole design. This is great for simple casual wear. Pair it up with jeans and a simple top plus accessories to compliment the Native American design and you’re good to go. Would you go for a white or natural color Cauzzie Pumps? Buy this Dolce Vita shoe here!